As well as showcasing computer graphics, the Siggraph exhibition has also hosted a fashion show featuring garments augmented by technology. The aim was to show that the merging of textiles and technology can be elegant and need not resemble a robot's cast offs. One of the more popular creations was designer Andrew Schneider's solar bikini that overlays the basic swimsuit with narrow strips of photovoltaic film sewn on with conductive thread. The suit produces a five volt output that, via the attached USB connector, can recharge gadgets like the iPod. The only drawback is that wearing it means no dip in the pool to cool off. New media artist Jenny Chowdury describes the "his and hers" bra and boxers set she has designed not as underwear but as a "collaborative videogame platform". 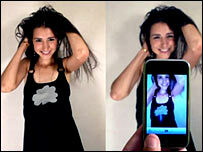 Intended for couples, the garments have six controller spots on them located at different areas. Couples play an associated video game by touching the controller panels in sequence, exploiting their intimacy to progress. Created by Massachusetts Institute of Technology (MIT) Media Lab student Connor Dickie, Kameraflage exploits the CCD and CMOS sensors in digital cameras to add a hidden layer of meaning or interest to clothing. Designs that are invisible to the naked eye are sewn onto garments. These are then picked up by digital camera sensors when the clothing is photographed. The prototype Kameraflage garments were all hand-sewn but Mr Dickie is now working on machined versions incorporating much more intricate designs. These jackets, fitted with sensors, microcontrollers and LED arrays, are designed for couples who want to let the world know how they feel. 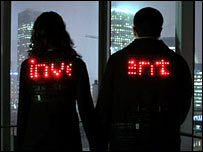 When two people wearing the garments hold hands the sensors pick up the connection and pipe text messages onto one array that then scrolls across to the other. By contrast, when the jackets are being worn singly they display their own individual message.The jackets were produced by Barbara Layne and Studio subTela at the Hexagram Institute. Leah Buckley's creation is less a garment and more a costume for a performer. It is studded with a variety of motion sensors that feed information, via built-in Bluetooth, about how the wearer is moving to a computer that interprets the sensor data. This can be used to create music or cue up video, audio or light displays to enhance performances. Joo Youn Paek's "conceptual garment" is made from polyethylene and connected to shoes that are adapted foot pumps. 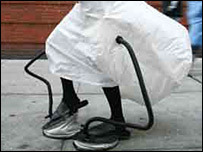 Via attached tubes, each step in the foot-pump shoes inflates the bubble attached to its rear a little more. When the bubble is big enough, the wearer sits down and slowly deflates the comfy seat. The idea, said Ms Paek, is to transform walking into something more akin to performance art. These accessories, created by MIT Media Lab research associate Elena Corchero, are intended for those who consider themselves eco-conscious. 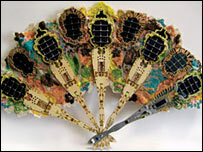 Each accessory, be it handbag, fan or bracelet, has built-in solar cells and low power light bulbs. By day, as the accessories are worn or carried the solar panels charge up. At night, when the accessories no longer need to be worn, they then transform into decorative ambient light sources for the home.